While Vincent van Gogh lamented his inability to pay human models, his financial dire straits harbored a bright side: it prompted the artist to seek other themes, of which he found plenty — and for free — in nature. 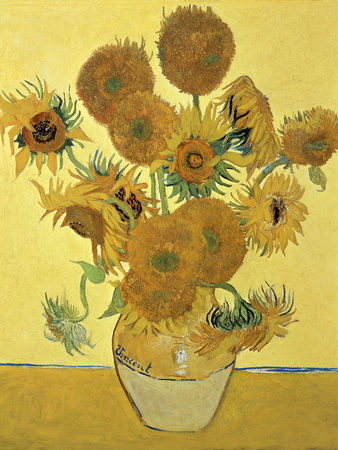 Thus, a series of still life paintings featuring sunflowers came from under the artist’s brush. Though there are common elements shared between them, each piece carries unique characteristics that set it apart from the rest. The painting above combines attractive and unattractive qualities, celebrating nature in its most vibrant and unadorned. Uncompromising rendering presents fading, worn blossoms, some of which lost their plumage altogether, corpses of what used to be flowers. The result is not pretty, at least not in the conventional sense. The top few blooms brim with life, and betray a subtext of “surprise” — of astonishment at the unusual situation of being torn away from the ground and placed into a foreign object. Van Gogh is very meticulous in handling the details, conveying deformity, and providing almost every possible unflattering angle. Most of the blossoms appear to be in various stages of decay; some have only begun to droop, others are completely broken. One head already lost its color, others are on the way, having lost all of their petals. 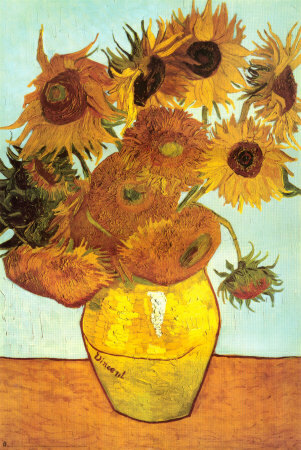 Differences in value expound these metamorphoses: the darker the yellow, the closer the sunflower is to total withering. Even the livelier, fresher flowers seem somehow exposed, showing their green hinder parts in a nearly indecent turn; together, the subjects appear to be in distress, acting almost as a pack of pursued animals would. The painting works on the emotional, as well the aesthetic level — it’s a beautiful still life that’s also a collection of dying flowers.